Recovery close call on forfeiture!! 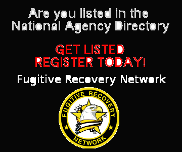 Post subject: Recovery close call on forfeiture!! I had a lady who had ducked me for almost a year... now in all honesty... I had been somewhat lacks on my searching... I figured she was still local here and was not too worried about finding her but all of a sudden, I woke up and realized that the forfeiture date was Monday... Jan. 11th. !!!!! and it was the first week in January. Well, I had used a group of recovery agents out of Richmond a few times and was pretty sure they could find her... the problem was that due to my inattention... time had creeped up on me and I had less than a week to find her before I had to pay the bill to the court. OMD Investigations our of Richmond was the company... Steve Mobly, who is on this site also... was the lead on this case. I called him... sent the info... he took the case... came to my area with the info we had come up with (I might also mention that Scott MacLean... a very good friend and co-business associate provided invaluable info also!!??) and got right to work tracking this lady down. Her "associates" very likely gave her an ultimatum to turn herself in or suffer the consequences... she chose the former. Case closed. No forfeiture to pay... all is done... I gladly paid Steve and he rode off into the sunset to work another case. THANK YOU STEVE AND CREW FOR A JOB WELL DONE. Call this company if you have anything needing fixed... they will ............. "GET R DONE"